What happens when you mix hot coffee, milk, bourbon and Marshmallow Fluff? You get The Dirty Santa cocktail (hey, we don’t name them!). Given the number of people who love a good cup of coffee, this could be a holiday hit. The drink is on the menu of Joe and Misses Doe, a casual restaurant in Manhattan’s East Village. 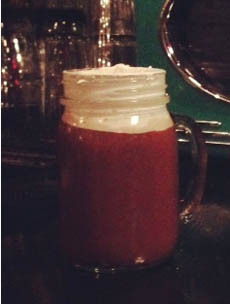 The Dirty Santa served in a trendy, pint-size drinking jar. Libbey sells a dozen for just $16.50. 1. FILL a microwaveable safe mug 3/4 of the way with coffee. Add milk, and syrup. 2. COVER the whole top of the mug with Fluff to seal in the liquid. 3. MICROWAVE for 2 minutes. 4. POKE a hole in fluff and pour in bourbon. We have a responsibility to maintain the accuracy of the English language, even if few other people seem to care about it. So Joe: It’s not Misses Doe, it’s Missus Doe. Misses are what happens when you fail to hit the ball, or overlook opportunities. Missus, or the missus, is the informal term of address for a wife. Teaching moment: Don’t carve anything in stone until you check a dictionary. Dictionary.com is an easy click away.